Eighty-three percent of Americans have at least one account on a social media platform. Almost half of the people in the U.S. have connected with a brand on a minimum of one social media channel. Because of its power, companies are constantly looking for ways to promote themselves through social media. Instagram in particular is important for brands. It is visual, and therefore well-suited to advertising products to a visual society. There are many Instagram marketing strategies we could consider. But here I’d like to focus on the importance of influencer and content marketing, as well as touch on Instagram’s new business platform. We’ll get to the importance of creating compelling content, which is crucial to capturing people’s imaginations. But if no one can find your awesome content, all your hard work will be wasted. To prevent that from happening, you need to network with influencers in your niche to build your followership. Of course, one great reason for finding influencers is to learn from them. Hopefully, what you have to offer is valuable enough that they will also be interested in learning from you. This is an important part of why you should be seeking influencers in the first place. But another reason is that influencers have established audiences who know and trust them. If influencers trust and support you, you’ll gain credibility with their audiences and gain additional followers. There are several considerations Instagram marketing solution Vibbi suggests that should guide you as you seek influencers to pursue. First, you should network with influencers in your same niche. Otherwise you’re wasting time gathering followers who don’t care about what you have to offer. But also explore more specific points on which you could connect with an audience. Maybe you post about women’s fashion, but are specifically interested in more of a 1950’s era style. Are there women in your influencer’s audience who prefer that style? They’re likely to be interested in following you. Influencers should also have goals that are similar to yours. Your main priority might be creating solid content, but another influencer is focused on gaining sponsorships. If you collaborate with that person, you will be less effective than if you both were pursuing the same objective. You also want to make sure that an influencer’s content is compatible with yours. Will it seem natural for him or her to post about your product in the future? Note that while you don’t want partners who are super promotional, it is helpful if they have experience working with brands. If influencers can incorporate some promotional content organically, they’ll be able to promote your content naturally as well. You might think that the higher the number of followers someone has, the higher the level of influence. But engagement actually trumps quantity. It turns out that influencers with around 1000 followers tend to have higher engagement rates than influencers with huge numbers of followers. Look at the number of followers influencers have and evaluate how their audience members interact with them. What do the users say in their comments, and what posts do they like? In addition to strong follower engagement, make sure that the influencer posts regularly as well. Do You Have Compatible Feeds? No doubt you want to make your own Instagram feed aesthetically pleasing and consistent with your brand. You should seek out influencers who are not only doing the same but whose tone also complements your own. Whatever else you do with Instagram, you should be using it to tell a story. Clearly identify what your brand stands for and what type of person you want to attract. Use that information to help your followers see themselves within the story you’re telling. Then encourage them to participate in that story as much as possible. One brand excelling at creating a narrative is Old Spice. Their Instagram posts are creative and absurd. 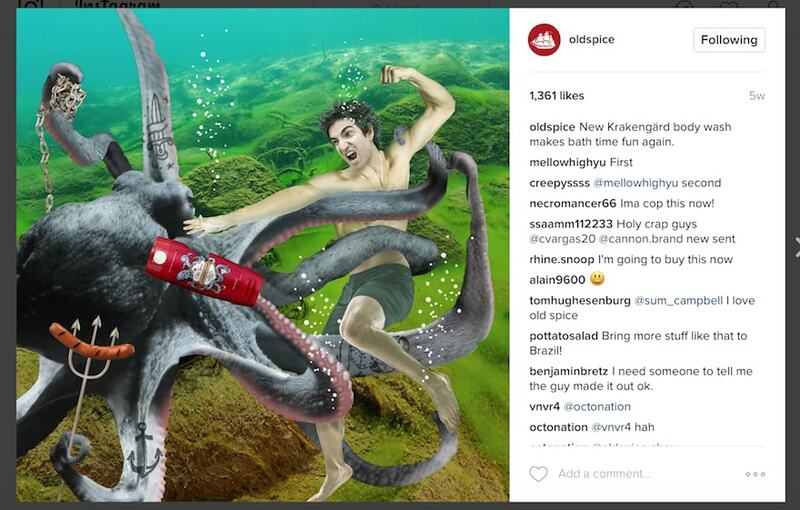 The marketers at Old Spice know their target audience: men—but not all men. They are aiming for the stereotypical “man’s man,” à la Ron Swanson. The brand depicts an over-the-top sense of strength, bravado, and adventure. Another way Old Spice is using Instagram creatively is by incorporating it with Facebook Live, as the company did for its Simu-Date-Her promo. Old Spice invited users to click on the link in the bio to get date etiquette practice for Valentine’s Day. When they did so, viewers did not merely watch a simulation of a man and woman on a first date. As the scene progressed, they could also vote on the next action the man should take. Their decisions determined how the scenario unfolded. The situation was certainly one to which many people could relate, and it was also comical. At one point, viewers voted for the man to make a car out of his date’s food. Another time, he had to paint a picture of her with one of his French fries. Participants essentially got to watch a movie whose plot they could control, something not unlike playing a video game. At the very end, the man started talking about Old Spice exclusively, a move that proved to be “too hot” and which ended the simulation. The concept was a fantastic way of promoting a product by engaging users in a story. Stories is a feature SnapChat originally created and which Instagram recently adopted. Users can publicly post pictures or brief videos. Followers can watch your post for 24 hours before it disappears. The concept of Stories is very popular, as evidenced by the fact Facebook just added it as well. Here’s how J.Crew used Stories to promote a pre-sale on its new pink sunglasses. Stories is obviously a great way to show someone enjoying your product. But don’t forget that it’s more important to show a lifestyle (and how your product supports it) than to show the product exclusively. You could use Stories to provide a behind-the-scenes look at your company. Or you could update your users with some interesting news related to your brand. How you tell the story you want to tell is limited only by your creativity. Another feature Instagram introduced recently is Albums. Now, instead of one image per post, users can upload several images that people can scroll through in a carousel. This is another format that would fit well with a concept like the one J. Crew used. Instagram is currently testing a new feature. When users are looking at a brand’s feed, they will be able to tap on items within an image to see how much each product costs. When users click on a tag, they’re taken to a page where they can buy the product without leaving Instagram. Here’s how it looks on a post by Kate Spade New York. A limited number of brands are currently trying out this option. The most attractive aspect of this feature is how much easier it makes it to purchase. Before, brands had to post images that made viewers excited enough to visit the company website. Or a brand could put a link in its bio where people could click through to purchase. But now with the user experience simplified even more, customers will be far more likely to buy. However, Entrepreneur contributor Madeline Popelka makes a compelling argument for brands not to jump at the new selling option. Popelka argues that Instagram (which is owned by Facebook) is likely to head down that same path. She believes that companies who jump at this new selling option will end up regretting it later. But brands that avoid this option will be able to retain their organic reach. They’ll avoid being labeled as sponsored (that is, ignored by users, who dislike ads interrupting their feeds). And they’ll be able to keep a personal touch instead of having to be overly promotional. By jumping in early, brands can drive sales now while there is little competition and it is easy for users to click and buy. If they do a good job of retaining customers, it would be worth it to them to add as many new customers using this feature as they can. Then later, if Instagram does make that change, they could convert their accounts to being less commercial. There is much more to explore when it comes to using Instagram for business. We haven’t talked about software for gathering important data, saving time through automation, creating quality images, or curating your feed. We haven’t discussed using hashtags or running contests. Nevertheless, strong content that appeals to your audience’s emotions will always be one of the most important areas on which you should focus. Then you’ll need to get that content in front of your user base. And whether or not you opt for Instagram’s new business feature, you should make it as easy as possible for your fans to complete your call-to-action. Jessica Mouser is a writer, public speaker, and avid reader. She is fascinated by how a culture's beliefs shape its technology and art. Actually one and the most effective strategy is promoting your instagram through ads and instagram bots. I used https://zen-promo.com/follow_bot_instagram to get more followers, comments and activity on my jog instagram account. With this service you maybuy more instagram followers which will be really interested in your account. I do not typically suggest that people buy followers. That is only beneficial if you end up with REAL accounts – not a bunch of fake accounts which will actually damage your interaction rates. Instagram is also a brilliant idea for Digital Marketing and Instagram is amazing app for social media. Jassica, thank you a lot for the article! All the essentials are in it. Jessica, thanks for sharing this wonderful tips on instagram marketing strategies. I have recently started using the application instagram for my online retail store and I have definitely took down certain keywords that you’ve mentioned that I’ve wanted to try to better promote my store. Thanks for sharing this! Hi Kathleen! You’re very welcome, and thanks for reading. I certainly hope these strategies prove to be helpful to you. Instagram is also a great idea for marketing and the Instagram has completed the social media marketing for own business website. Hi Jessica, i proved by reading your post that quality is better than quantity! Because i have read a lot of long post but i was failed what i want. That i got it in your post! Great thaks Jessica!!! By the way Instagram has 600 million monthly users, at least according to some numbers announced back in December, 100 million of those joining the service in the six months before! 400 million daily active users now on Instagram (Last updated 2/2/2017)! Hi Lisa. I’m glad the post was helpful to you! That’s pretty wild. Instagram is definitely a popular app. Thanks for reading! Incredible Post dear truly amazing post. I was discovering things for Instagram promoting and here your post comes. A debt of gratitude is in order for such a valuable data. Keep doing the job so that we can get more information. I think Story telling can definitely be your best marketing strategy in Instagram. i have been trying it over an year and it has really worked for me. Thanks Jessica Mouser for sharing more insight on Instagram marketing. Much thanks. That’s awesome! You’re welcome, and thank you for reading. This is a very good tip particularly to those fresh to the blogosphere. Short but very accurate information… Thank you for sharing this one. A must read the post! GREAT Post dear really awesome post .i was finding things for Instagram marketing and here your post comes.thanks for such a useful information. Fantastic post. Short, precise and to the point. Influencers from Content industry, Growth hacking, Conversion rate optimization use Instagram for their BUSINESS? Hi Abrar, I’m not exactly sure what you’re asking. But I definitely think businesses should be on Instagram, especially if their posts are providing value to their followers, in addition to promoting their products. Posts should be published frequently to increase awareness & followers. This strategy will help you in engaging more audience. I agree that posting strong content on a regular basis is important. I do think it’s good to be aware how often you should post on each platform. For example, it’s acceptable to post much more frequently than on Instagram or Facebook. First of all, Your content very user friendly. I hope so, Your instagram strategy helpful in my marketing . Jessica such a you always provide latest and informative stuff. Never thought of that but yet it helps me understand about marketing on Instagram. Thank you for sharing this on point and precise article. You’re welcome, Elaine! Thanks for reading. Thank you for sharing this useful information regarding marketing on Instagram. These tips would help us update the social media marketing strategies implemented on our business websites.